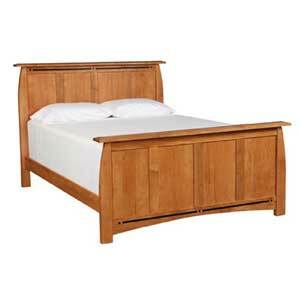 A classic silhouette and rich Cherrycraft finish lend this queen bed a unique Arts and Crafts style. 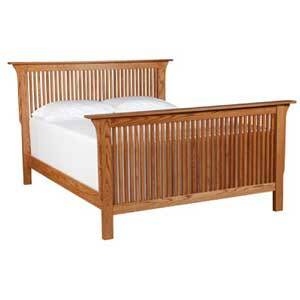 A simple wood frame is embellished with vertical wood slats on the headboard and footboard for a natural look that pairs beautifully with Mission decor. 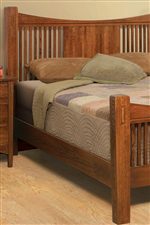 Solid center panels on the headboard and footboard highlight the exposed wood grain of the oak, while a warm Cherrycraft finish further refines the Mission appeal of this queen slat bed. 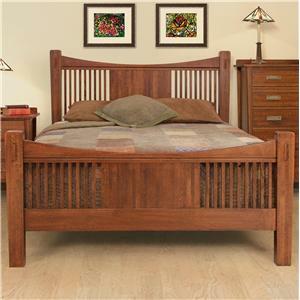 Gentle curves frame the bed for a beautiful yet understated finish. This style is available in king, queen, full and twin sizes. 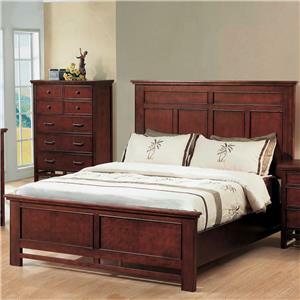 The Heartland Queen Slat Panel Headboard & Footboard Bed by Witmer Furniture at Mueller Furniture in the Lake St. Louis, Wentzville, O'Fallon, MO, St.Charles, St.Louis Area, MO Furniture Store and Belleville, Shiloh, O'Fallon,IL area. Product availability may vary. Contact us for the most current availability on this product. 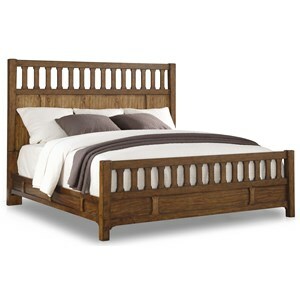 BO11750FBSL-Q Queen Slat Footboard 1 64"
BO11752HB-Q Queen Headboard 1 64"
Finish Oak in a light finish. Finish & Paint Options Finish choices include Natural, Light, Medium, Fruitwood, Westwood, Cherrycraft, Mission, Brownwood, Esspresso, White, Brightwood, Vanilla, TJ, Cherry and Black. Handles & Hardware Standard with Heartland pulls. Case Detail Each piece is anchored with simple post legs or feet. Drawer / Shelf Construction Constructed from quarter-sawn oak in a Cherrycraft finish. Drawer Suspension Standard with full extension drawer glides. Customizable Options Comes in an assortment of wood, finish and hardware configurations. Description: Top Simple unadorned tops with low profile backstops. Case Construction Shown in oak with a warm Cherrycraft finish. Wide range of woods and finishes also available. 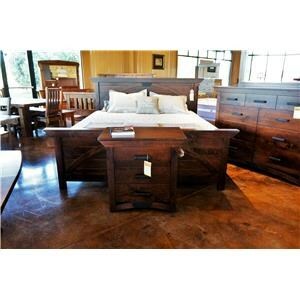 True to its name, the Heartland bedroom collection blends classic Mission shapes and natural finishes for beautiful master or guest bedroom furnishings with just a hint of country style. Simple frames define the Mission style and are dressed up with understated details like rounded backstops, brass look hardware and gently arched aprons on the night stand, dresser and chest. 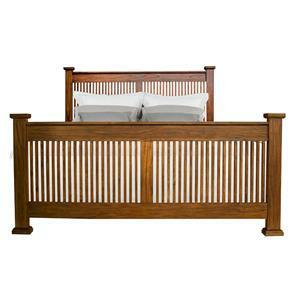 A beautiful bed features matching vertical slats on the headboard and footboard for a balanced look, while solid center panels highlight the richness of the exposed wood grain repeated throughout. 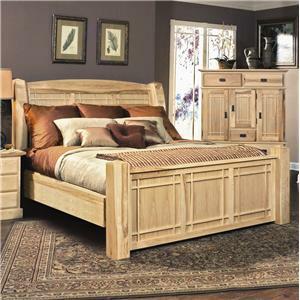 Shown in oak with a warm Cherrycraft finish, the Heartland collection is infinitely customizable with an assortment of offered woods, finishes and hardware configurations. The Heartland collection is a great option if you are looking for Mission furniture in the Lake St. Louis, Wentzville, O'Fallon, MO, St.Charles, St.Louis Area, MO Furniture Store and Belleville, Shiloh, O'Fallon,IL area.